2) Internal Organs: Area #2 is your "go to" for minor aches that occur in the internal organs. If the pain is severe or does not go away, medical attention may be warranted! 3) Joints: Just above the center part of the outer ear is the spot to apply pressure when relief from minor aches and pains in the knees, hips, and other joints is in order. Sooner or later medical attention might be needed. But when you're in a pinch this is something to try! 4) Throat/Sinuses: If you feel like you're coming down with a cold and have sinus pressure or a sore throat, zone 4 is the place to go. 5) Digestion: Minor stomach problems are all too common. Sometimes you just don't have any appropriate medications on hand but you need r-e-l-i-e-f. 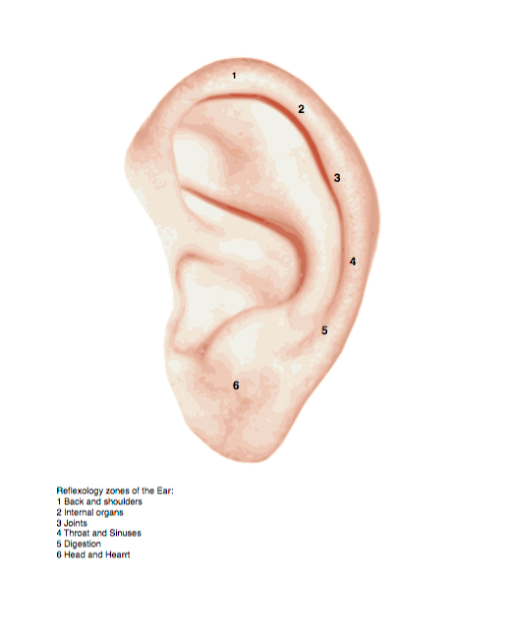 Zone 5, located just above the earlobe is the correct place to apply pressure in this situation. your best bet for either of these.